The beginner’s luck that I had with my first two sweaters this year has spolied me. I was crusing along having deluions of closets full of sweaters by the fall. Cabled, lace, v-necks, rollnecks, boatnecks, buttons, snaps, zippers, you name it – I can dream it. My first suspicion was with the schematics that were acommpaning the sweater. There was only two measurements for the front and back piece – the width at the bottom and the length. It doesn’t tell you if that’s with or without the picked up ribbed collar nor does it tell you how much the decrease was for the waist shaping – nor the armsleeves, you get my point. Plus, the total length of the sweater I’m knitting is 22inches – which on my humble 5’3” frame would land the bottom ribbing around my hips. The sleeve schematic is even more suspect. It lists only the length of the sleeve and that’s it. No width what so ever. No real sense on how I should block the sucker. In the end the pattern then turns into more of a guideline than a real sweater pattern which is all new territory to me. I am a pattern follower. I am the one who will follow the directions for pancakes on the back of the Bisquick box to the T. I love to follow directions for some reason. To whip out schematics or directions and put things together step by step. I like being told what to do. Takes that whole area of thought out of it and let’s me put my energies into creating. What’s strange about this idealism in me is that I also wholeheartedly LOVE to be creative. To come up and brainstorm new things. To have a blank slate and do whatever it is I please… but once I come up with it it’s nice to have someone else tell you what to do and how to make it. Perhaps I feel like I’m not ready yet with that kind of knitting. That I don’t want to crash and burn with my own ideas rather follow the trusted and true patterns that will get you a pretty sweater 90% of the time. This fear is stupid I know, I laugh all the time to myself when I say I’m afraid of my knitting. Be afraid of sky diving or something. This fear lies in the idea that you’ve wasted time knitting something that wasn’t right and that stinks! But it happens to all of us and the "wasted time" turns into "learning time" because without it you probably wouldn’t have learned something new. Right? Oh a much cheerier and non-suspect note, my dear friend Dana, who so needs a blog, got me a very unexpected (or very late Christmas, however you’d like to look at it) present! Stitch Markers from the Zephyr ladies and look what it says!! So sorry I missed you yesterday! The yarn was calling me though. I’m just coming in to my own with this pattern tweaking stuff. I would LOVE to follow directions – it seems that the more I knit though, the more I find that all of these patterns have something really wrong with them. always trust in the swatch no matter what the scematics say….. I love those stitch markers! What a sweet friend. Hopefully the knitting will get back on track for you and you will have that closet full of sweaters! How frustrating that the schematics are so poor! I would like to be able to design my own sweaters some day, but first I feel I need to follow a few good patterns to see what makes them good. I’ve been surprised at how difficult it can be to find a good pattern! Good luck! The stitch markers are adorable! I’ve tried drinking cocktails while knitting (NOT good! 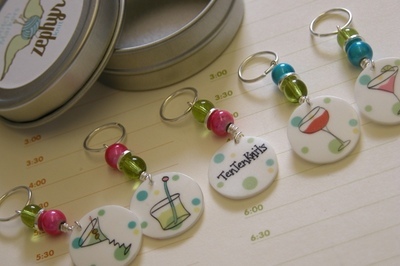 ), so cocktails on the stitch markers may be the way to go. You have your own custom stitch markers. How fun! Making a well fitting sweater is such tricky business. The key I have found is to not discount row gauge. That and a good schematic. I hate a bad schematic. I hope you are able to work it out though!